Like a typical Malaysian, I love dipping almost everything edible into chili. 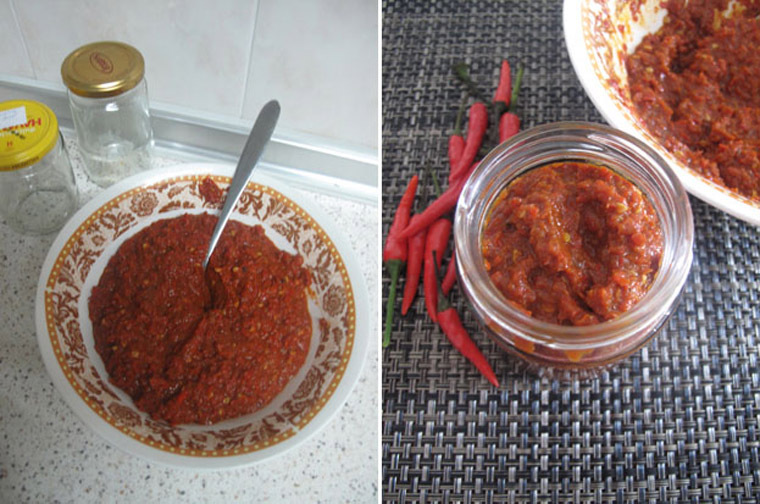 One of my absolute favourite is the spicy belacan dip that my mother often keeps in her fridge. She serves it with all kind of dishes such as claypot chicken rice and bihun. This condiment is a must-have at our steamboat part. Sometimes we even boil ladies fingers and dunk in this delicious dip! 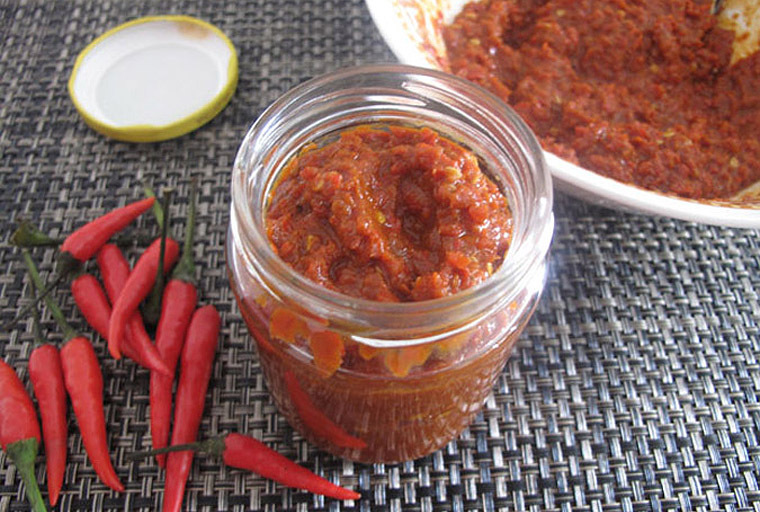 I’m glad to find that this hot condiment easy to make. Even if you rarely go into the kitchen, you can nail it, I promise! It requires no other skills than blending fresh ingredients in a food processor and then heat up on the stove. Don’t worry, it’s not cooked with oil so chances of it getting overcooked is very low. Step 1 PREP: Squeeze lime juice. Cut and deseed both red chili and bird’s eye chili. Chop tomato into quarters. Step 2 BLEND: Put chopped chillies, tomato and roasted belacan in a blender. Process until fine. Step 3 COOK: Transfer the blended paste in a wok. Turn on medium heat. Add lime juice and let it cook until the bright red chili paste turns darker (about 10 min). Then, add sugar to taste. 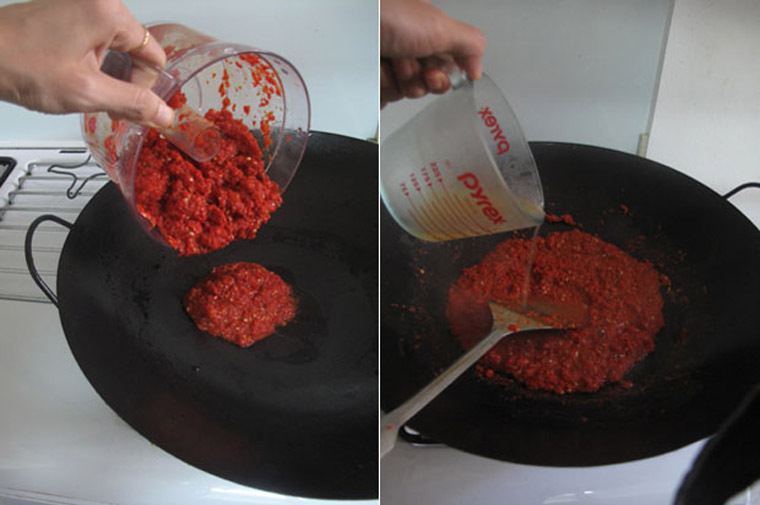 Step 4 STORE: When belacan chili cool, transfer into air-tight container. Keep in the fridge. 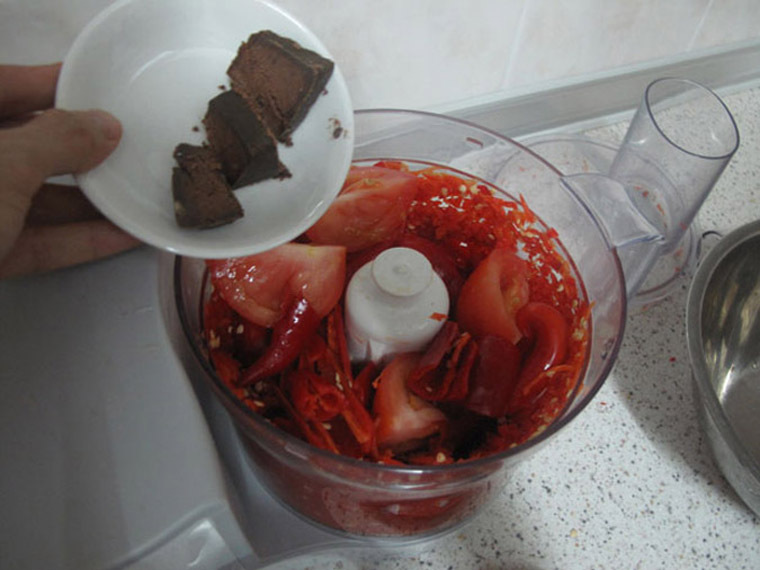 Blend 450 g of red chili + 5 pcs of cili padi + 1 tomato + 4 tbsp of belacan until fine. Cook on stove with 1/4 cup lime juice (10 min). Season with sugar. Transfer to bottle. As the degree of spicy heat in chili and sweetness in tomato differs, the above measurement is only a guideline. If it lack fragrance, add more belacan. 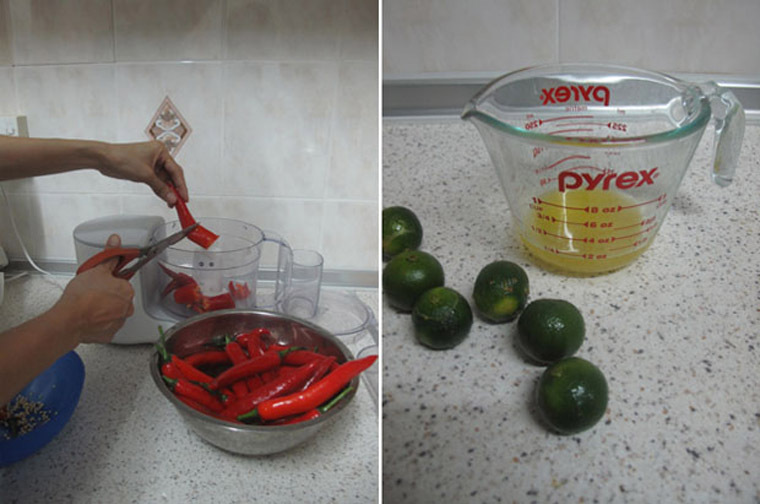 If it’s too spicy, balanced the taste with lime juice and sugar. Cooking the paste allows you to keep in the fridge for a longer time. So does keeping it in a clean container. To save time and reduce washing, I like to deseed chili directly into a plastic bag and use a pair of scissors to cut chilis directly into the food processor. This recipe makes two small containers. Enjoy this dip (with almost everything)!